[PDF] Handbook of Statistical Distributions with Applications (Statistics: A Series of Textbooks and Monographs) | Free eBooks Download - EBOOKEE! Description: English | 2006-06-19 | ISBN: 1584886358 | 346 pages | PDF | 5.93 mb In the area of applied statistics, scientists use statistical distributions to model a wide range of practical problems, from modeling the size grade distribution of onions to modeling global positioning data. To apply these probability models successfully, practitioners and researchers must have a thorough understanding of the theory as well as a familiarity with the practical situations. The Handbook of Statistical Distributions with Applications is the first reference to combine popular probability distribution models, formulas, applications, and software to assist you in computing probabilities, percentiles, moments, and other statistics. Presenting both common and specialized probability distribution models, as well as providing applications with practical examples, this handbook offers comprehensive coverage of plots of probability density functions, methods of computing probability and percentiles, algorithms for random number generation, and inference, including point estimation, hypothesis tests, and sample size determination. The book discusses specialized distributions, some nonparametric distributions, tolerance factors for a multivariate normal distribution, and the distribution of the sample correlation coefficient, among others. Developed by the author, the StatCal software (available for download at www.crcpress.com), along with the text, offers a useful reference for computing various table values. By using the software, you can compute probabilities, parameters, and moments find exact tests and obtain exact confidence intervals for distributions, such as binomial, hypergeometric, Poisson, negative binomial, normal, lognormal, inverse Gaussian, and correlation coefficient. 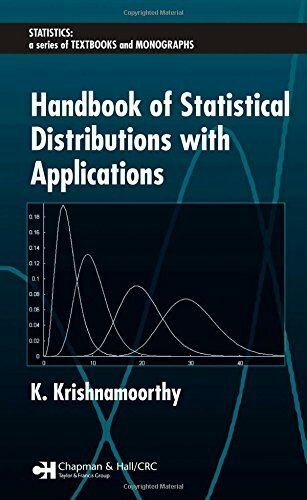 In the applied statistics world, the Handbook of Statistical Distributions with Applications is now the reference for examining distribution functions - including univariate, bivariate normal, and multivariate - their definitions, their use in statistical inference, and their algorithms for random number generation. No comments for "[PDF] Handbook of Statistical Distributions with Applications (Statistics: A Series of Textbooks and Monographs)".